I just wonder what Calamity GANON’S up to! Many videogame franchises, like movie series, tend to be of inconsistent quality, although critics may extol some to the point where finding legitimate dissenting opinion tends to be tedious at best. Nintendo’s fabled The Legend of Zelda franchise is one such pantheon, with mainstream videogame critics lauding its first three-dimensional entry, Ocarina of Time, as one of the greatest games of all time and a beacon in an otherwise-lackluster Nintendo 64 lineup. In 2017, the Big N released the latest entry of the series, The Legend of Zelda: Breath of the Wild, on the Wii U and Switch, again garnering near-universal praise, but is it justified? Breath of the Wild opens with yet another incarnation of series protagonist Link awakening after a century in cryostasis with no memory of the time before, with a main quest focusing on visiting various locations indicated by photographs in a Sheikah Slate of which he comes into possession so that he can see memories of his past with Princess Zelda’s crusade against an antagonist force known as Calamity Ganon. With this setup, players can be forgiven for experiencing some trepidation, given that many other videogames have done amnesia plotlines to death, and this entry certainly doesn’t do it any better than other titles with the trite narrative device. The goals of rescuing Zelda and defeating Ganon have, too, been done plentiful times. 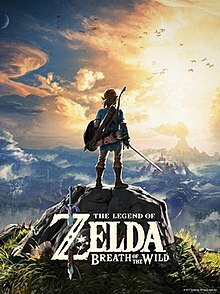 That leaves the gameplay to shoulder the burden, with Breath of the Wild sporting nonlinear open-world play that starts Link off in a vast explorable world, with the mute hero quickly obtaining all tools necessary to solve whatever puzzles may come in Shrines liberally spread throughout the world whence he can obtain Spirit Orbs, four of which he can exchange for either an extra heart container (Link starting with three) or a hint of stamina necessary to climb obstacles from which he falls when running out of it, although players might want to hold out on the latter since sleeping at some inns in the world can net him a temporary extra stamina ring, and maybe a few extra maximum hearts. Players can outfit Link with clothes and/or armor that provide heightened defense, sometimes resistance to hot and cold elements that is in fact necessary to fully explore Hyrule, not to mention weapons, shields, and bows to shoot arrows. The game restricts the amount of equipment the player can carry at once, and while sidequests can increase these limits, maximum load is hardly critical to success throughout the game. Weapons one or two-handed, shields, and bows gradually wear down and break after excessive use, although clothes remain intact, players able to increase its defense by visiting fairy fountains and consuming specific parts gained from killing most monsters. Link can use some of said ingredients, in addition to meat gained from killing wild animals and other foodstuffs found throughout the world, up to five of which he can carry at once, to cook consumables that can perform duties such as granting temporary increase to attack and defense, resistance to hot or cold, and recovering hearts. Lamentably, Breath of the Wild doesn’t track recipes like so many other titles with similar item creation mechanics do, which augments the general artificial difficulty throughout the game. Keeping plentiful healing items tends to be critical to success against most adversaries, and fortunately, ingredients that formulate such consumables at least receive indication with heart icons. Another main goal is to subjugate the four Divine Beasts at several corners of Hyrule, although the player can actually forgo this task and confront Calamity Ganon any time but doing so without meticulously exploring the world would be far more difficult. Beating the bosses possessing the Divine Beasts grants Link both an extra heart container and a special ability that has limited use and needs time to recharge after the player uses them. There are other quirks with combat such as Link being able to jump, especially effective when doing so from high up, and granting him the ability to slow time when using his bow and various kinds of arrows, making hunting and defeating some foes easier. In general, the gameplay definitely has plenty going for it, with standard battles against foes allowing players to use the targeting system present in other three-dimensional Zeldas for more effective combat, although the trio of dimensions and the camera create issues that are otherwise absent in titles with 2-D gameplay. Some of the puzzles necessary to complete shrines and increase Link’s stamina and hearts are actually fairly enjoyable, even though some might necessitate a guide, a few being tedious such as one where the player has to guide a ball through a maze and launch it onto a slope. In the end, the general game mechanics are a positive. Control in Breath of the Wild is, however, perhaps its low point, given the general lack of direction and need to reference a guide to make the most of the gameplay itself. The maps of the Divine Beast dungeons, moreover, are actually somewhat unhelpful, appearing as three-dimensional transparent models rather than as individual chambers with various floors like in Ocarina of Time’s automapping system, players needing to activate terminals indicated by dots before facing their bosses. The player can also expect to die often, and there is absolutely no excuse for loading times in a cartridge game, occurring largely during the teleportation to shrines and towers that unveil maps for Hyrule’s various regions. Ultimately, the developers could have certainly given interaction a once-over. Zelda games tend to feature enjoyable soundtracks, although Breath of the Wild even falters in this area, given the general lack of music and overreliance upon ambience during exploration, although there are a few decent tracks, even if some existed in prior installments of the series. This entry is also the first mainline entry, not counting the Unholy Triforce of Phillips CD-i titles, to feature full voice acting during cutscenes, which is actually pretty good, even if the lips sometimes don’t match spoken words, and with pleonasms that the localization team could have compressed such as “past one hundred years” into “past century.” All in all, the audio too could have used more memorable music. A high point of the game, however, is its visual presentation, sporting a style that bridges the line between realistic and celshaded, with believable character and enemy models, not to mention pretty scenery with realistic colors, although some of the textures appear blurry and pixelated at times, and there is occasional pop-up regarding things such as foes and wild animals. There also exist the oddity, within the game menus, of a model of Link appearing to eat invisible food whenever the player uses a food item or potion, although this is hardly a deal-breaker in an otherwise pretty videogame. Overall, The Legend of Zelda: Breath of the Wild definitely has some things going for it, such as its serviceable open-world gameplay, nice voice acting, pretty graphics, and enough reason to play on. However, like Ocarina of Time before it, it scarcely justifies the acclaim it’s received as one of the greatest games of all time, given many superior titles within and without the Zelda franchise, not to mention issues such as its difficulty without Internet reference, loading times, the generic plot, and minimalist audio presentation. In fact, had it been this reviewer’s first Nintendo Switch game instead of the vastly-superior Super Mario Odyssey, he would have been downright furious, although those who still own Wii U’s might find it a good time sink. -Loading times in a cartridge game…come on. Not as great as critics claim, but far from terrible. Playing Time: No in-game clock.